San Diego Chargers: Huddle Up to Cuddle Up Success! 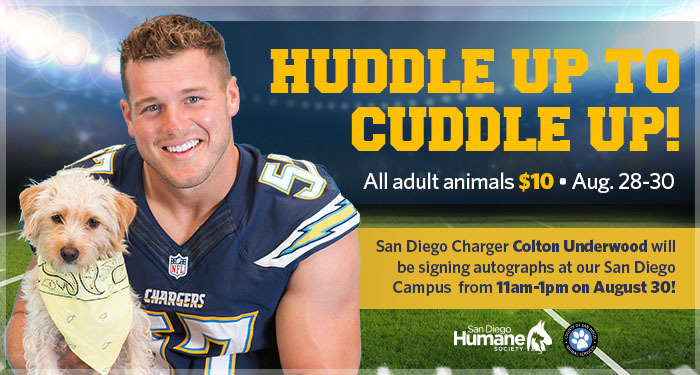 The Chargers are hosting the 1st Annual “DOG DRAFT” to benefit animal rescue so we’re throwing it back to our Huddle Up to Cuddle Up with NLF Linebacker Colton Underwood and the San Diego Chargers! It’s officially safe to say the Chargers community have taken significant charge in San Diego animal rescue! San Diego Charger Colton Underwood, a very proud “dog dad”, rallied up his teammates to shine light on the importance of animal welfare and shelter pet adoption. 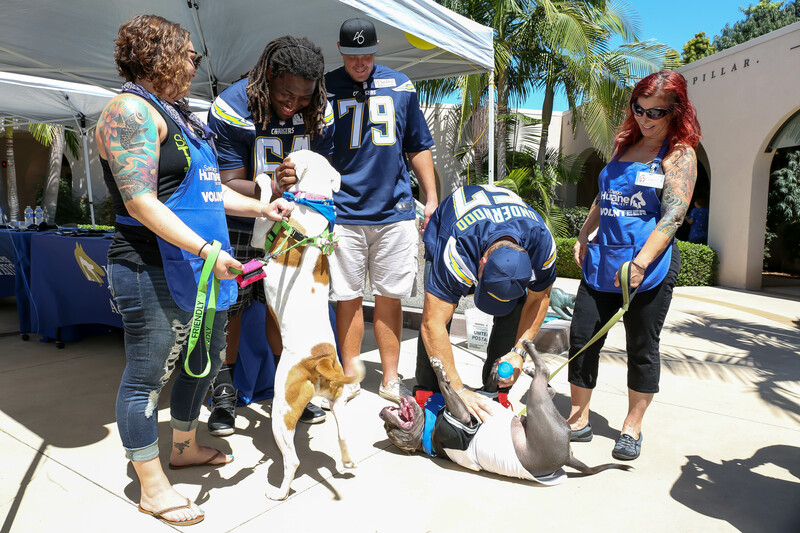 The event called “Huddle Up to Cuddle Up” sponsored by Barking Beast, set out to benefit the San Diego Humane Society and was held at their San Diego Gaines Street campus. 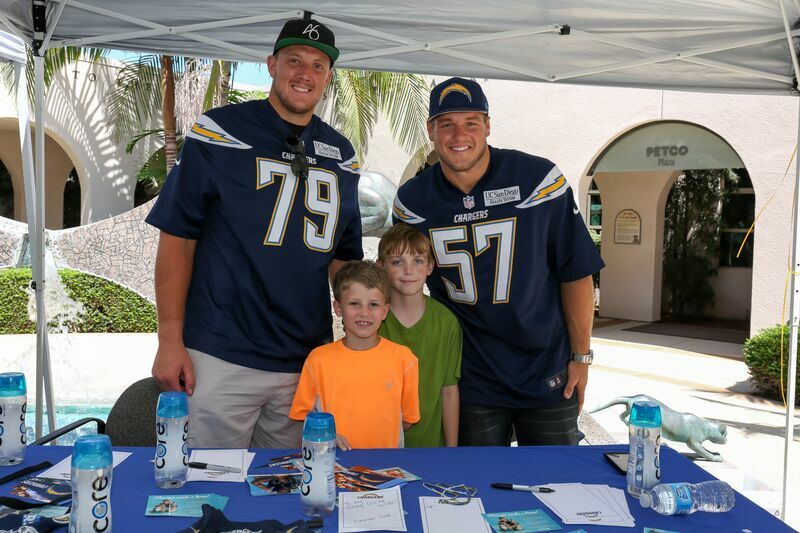 Throughout the afternoon, prospective families looking to adopt took part in festivities that included complimentary lunch, autographs with the Chargers, and pet give-aways, in hopes of inspiring people to rescue a pet. Players in attendance were Colton Underwood, Kenny Wiggins, Craig Watts, Nick Dzubnar, and Javontee Herdon who were all sure to make the day of their fans, and especially that of animals in need. 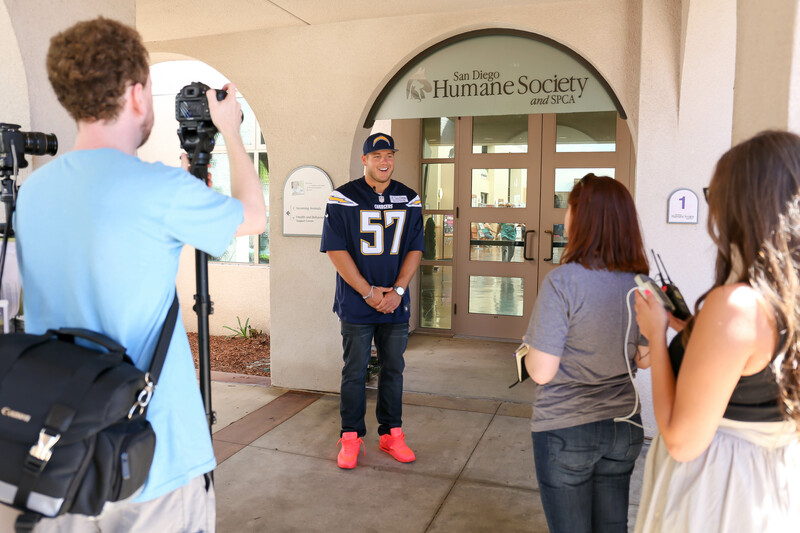 Up until Sunday, the last Charger to bring attention to animal rescue in San Diego was in early 2014, when linebacker Thomas Keiser took part in a campaign hosted by the San Diego Humane Society to help Sack Stereotypes on Pit Bulls. 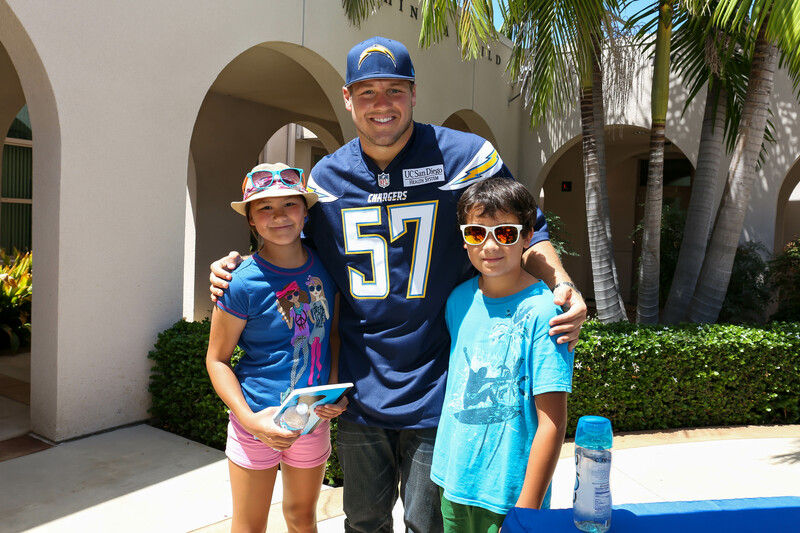 You can imagine the excitement when animal lovers discovered Chargers star on the rise Colton Underwood’s enthusiasm for pets! Having grown up a country boy, Underwood is no stranger to living in harmony with animals, especially with dogs. He shared with Barking Beast that to him the family dogs are like brothers and when he’s away on football, he always makes sure to Face-Time with them! ‘Can we say, ‘Dog Father of the Year’? The pet adoption is not the first benefit Underwood has put on for his community. Over the summer his foundation the Colton Underwood Foundation hosted a football camp for the youth in his home of Indianapolis, Indiana, featuring his teammates to help raise money for Cystic Fibrosis. Thank you to all the sponsors Petco, Phil’s BBQ, My Perfect Pet, RuffTies, and CoreWater who helped make this event a success! And SPECIAL thanks to the San Diego Chargers Community and Colton Underwood for helping bring out families to adopt animals in need. Keep up with Colton Underwood and his love for animals on his Twitter & Instagram and be sure to catch highlights from Sunday’s event NEXT Tuesday on a special SDLive at 9:30PM featuring Padres starting pitcher Andrew Cashner and his labrador retriever Lindsey in studio! Airs on the FOX Sport San Diego network, available on every cable provider.